Julie-Anne started her career when she was awarded a scholarship to study singing and classical guitar at the Royal Academy of Music in London. Whilst there she won prizes for singing and was awarded a further scholarship for advanced opera training. In addition to her operatic singing, Julie-Anne has diversified into other singing disciplines; performing Early Music, Sacred Music and Show Music. She is currently working on two albums: the first with an English composer who is writing a piece especially for Julie-Anne’s pure toned voice; and the second, a CD which uses her voice as a healing tool for personal transformation. Julie-Anne certainly provides a musical mélange of styles these days! 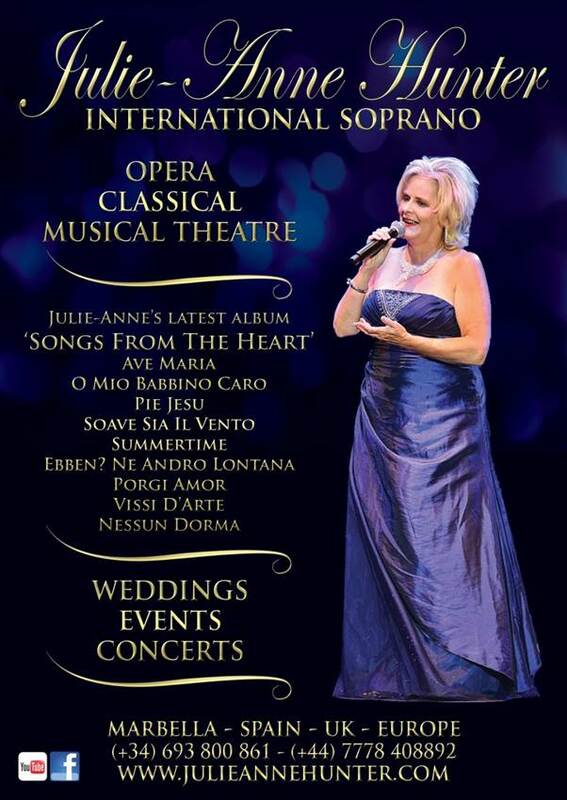 Julie-Anne is available for Weddings, Events and Concerts in the UK, Marbella, Spain and throughout Europe.